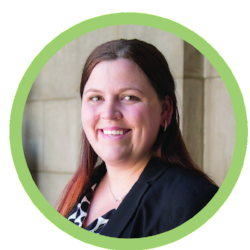 Nikki works with the Rooted in Relationships Initiative where she assists state and community partners to develop systems of care that support the social and emotional wellbeing of children birth through age 8. Nikki has worked for Nebraska Children since March 2018. Before that, she worked for the State of Nebraska - Division of Behavioral Health administering funds for and coordinating work on substance use and suicide prevention as well as mental health promotion. Nikki has spoken at several state and national conferences on topics such as Culturally and Linguistically Appropriate Services (CLAS), building state prevention systems, developing data systems for prevention, and Screening, Brief Intervention, and Referral to Treatment (SBIRT). In 2017, Nikki was the recipient of the State of Nebraska’s Excellence in Leadership Award presented by the governor. Nikki has two bachelor of arts degrees in Psychology and English from the University of Nebraska and her Master of Arts in Counseling from Doane University.